Freedom is the key to any great vacation. That means the freedom to see new countries, dive into different cultures & cuisines, and uncover hidden gems along the way. But a perfect trip should also mean relaxing exactly the way you want. That’s why Thrillist partnered with Norwegian Cruise Line to sail us to some of their many unique ports of call, so we can show you how to tackle your best day trip. And whether you’re exploring Lima’s Jesuit Temple of San Pedro, or touring the colonial mansion of Casa Aliaga, cruising with Norwegian means you always come home to amazing food, entertainment, and accommodations to recharge for the discoveries to come. 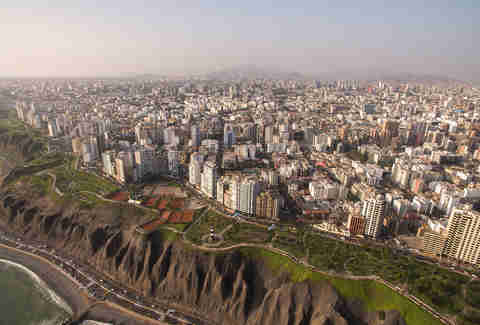 When it comes to the perfect vacation destination, it doesn’t get much better than Lima, Peru. This South American metropolis is a coastal paradise, offering up a zillion ways to spend your day, from exploring historical landmarks to digging into signature cultural dishes. From sunrise to sundown, you’re bound to have an exciting day in Lima. Here’s where to start when it comes to food, sites, and everything in between. Any local will tell you leaving Lima without indulging in its signature dish would be a crime against humanity -- and seafood. Ceviche, made by curing raw fish or seafood in a cocktail of citrus and spices called Tiger’s Milk, is everywhere you turn here. Just ask Mission Ceviche founder and chef Jose Luis Chalvez, who dedicated his life to the dish after first tasting it in 2006. “Ceviche in Peru is culture. It’s life, it’s everything,” he says. “It’s something that’s going to change your life.” For a quick bite, Chalvez recommends El Cevichano in Miraflores’ Mercado de Surquillo. Of course, if you want to take your time, head to Punto Azul or Mi Barrunto for a sit-down ceviche meal and wine. With Condor Xtreme, you’ll get a bird’s-eye view -- AKA, the best view -- of this coastal city. 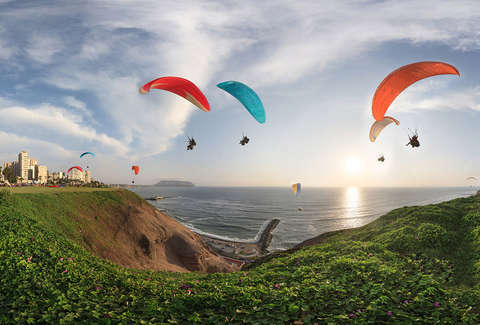 No matter what time of day you arrive in Lima, Condor Xtreme paragliding can send you soaring over the city’s Costa Verde (green coast) where you’ll experience breathtaking views of the Pacific Ocean, the Miraflores Cliffs, the San Isidro district, and Magdalena. Tours are offered every 10 to 15 minutes and can accommodate two people at a time for about $51 (or 170 soles). At the end of your flight, you’re given a video keepsake to remember… well, that time you flew thousands of feet over Lima. In the upscale and residential Miraflores district sits Parque Kennedy, a park honoring former US president John F. Kennedy and the aid he provided to the South American country during his short term. 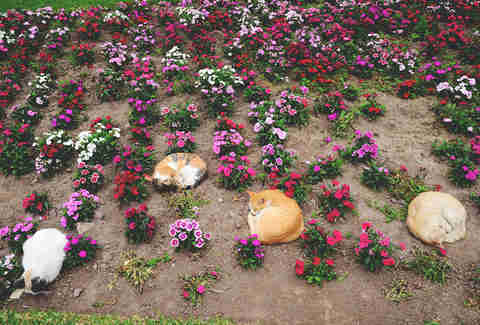 Oddly enough, the park has become home to over 100 stray cats and kittens over the past few decades. The mysterious (but very friendly) little felines have taken shelter there, resulting in a somewhat unconventional tourist destination. You’ve got to admit, a lush green park overrun by cats is a sight to behold while you’re in town -- even if you need a few allergy pills to do so. 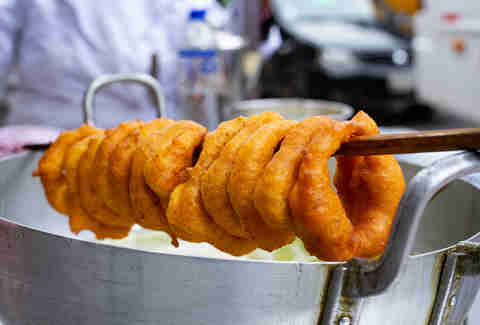 If you plan on spending some time in Parque Kennedy, you’ll get to experience Lima’s vibrant street food scene -- which starts with world-famous picarones. Made of sweet potato and squash, these donut-like rings are dipped in different syrups for a piping hot, fried, and sweet treat. At Parque Kennedy, look for Jhosimar Valverde’s stand Picarones Mary, plus more vendors serving up butifarra, a Peruvian-style ham sandwich with lettuce, onion, mustard, mayonnaise, ají amarillo (hot yellow pepper) paste, and more. It’s not every day you get to explore pyramids built around 400 AD, but on the day you visit Lima, it’s easy to be transported back to the past. At the Museo De Sitio Huaca Pucllana, you can immerse yourself in ancient civilizations by taking a tour of the Huaca Pucllana preserved heritage site. 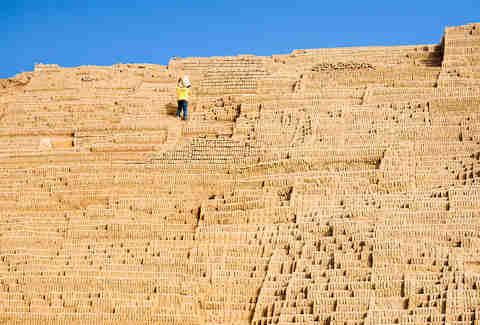 The eastern side is the half believed to have been used for administrative purposes such as public meetings and storage, while the western side houses the 72-foot high pyramid where ceremonial religious gatherings took place. The museum complex has ceramics, textiles, tools, and other artifacts on display from the time the site was built -- and you can even dine at its restaurant overlooking this rich Peruvian history. As the sun goes down, head over to Parque de la Reserva for an unforgettable light and water show known as the Magic Water Circuit. The $13 million project finished construction in 2007 and has been dazzling local families and tourists alike ever since. 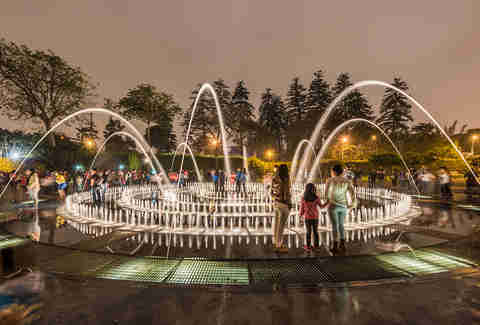 Thirteen stunning illuminated water fountains are available for viewing for just a $4 entry fee, and the Fuente de la Fantasía puts on a choreographed water show with lights, lasers, and music three times each evening. Photos and videos don’t do it justice. When you only have a day in an exciting foreign city, it’s important to leave time to simply take in its beauty. In Lima, that can best be done strolling or biking the scenic El Malecon walkway. Constructed atop oceanside cliffs, this coastal path is about six miles long, and is typically always flooded with chirping birds, locals jogging with their dogs, and tourists soaking up the sunny views. Mirabici is located right next to El Malecon and offers bicycle tours or rentals if you’d like to guide yourself. But there’s really no wrong decision when you get views like this.